Review this sample resume for a midlevel scientific laboratory technician to see how you can translate lab results into a results-oriented resume. Quality control and data integrity are essential in lab work, so does your resume pass the quality test? To be a successful candidate for lab tech jobs, resume expert Kim Isaacs says it helps to have a comprehensive resume. 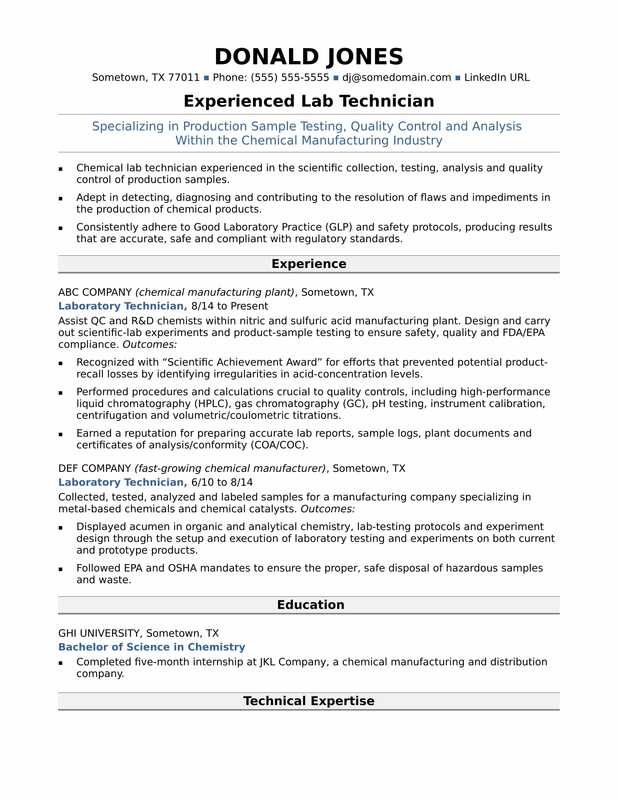 To see how you can translate lab results into a results-oriented resume, review this sample resume for a midlevel scientific laboratory technician that Isaacs created below. You can also download the midlevel lab technician resume template in Word. And if you need more help, let the experts at Monster's Resume Writing Service create a high-impact resume for you that will impress employers. Medical lab technician jobs are projected to grow by 13% (or 42,700 jobs) from 2016 through 2026, according to the Bureau of Labor Statistics (BLS). You’ll find the highest level of employment for this job in the following states: California, Texas, New York, Pennsylvania, and Tennessee; and in the following metropolitan areas: Los Angeles, New York City, Baltimore, Chicago, Atlanta, and Boston. As a medical lab technician, you can expect to make a median wage of $51,770 per year, or $25 per hour, according to the BLS. Additionally, you can search for laboratory technician jobs on Monster. Chemical lab technician offering five years of experience in the scientific collection, testing, analysis and quality control of production samples. Adept in detecting, diagnosing and contributing to the resolution of flaws and impediments in the production of chemical products. Consistently adhere to Good Laboratory Practice (GLP) as well as safety protocols, producing results that are accurate, safe and compliant with regulatory standards. Assist QC and R&D chemists within nitric and sulfuric acid manufacturing plant. Design and carry out scientific-lab experiments and product-sample testing to ensure safety, quality and FDA/EPA compliance. Recognized with “Scientific Achievement Award” for efforts that prevented potential product-recall losses by identifying irregularities in acid-concentration levels. Performed procedures and calculations crucial to quality controls, including high-performance liquid chromatography (HPLC), gas chromatography (GC), pH testing, instrument calibration, centrifugation and volumetric/coulometric titrations. Earned a reputation for preparing accurate lab reports, sample logs, plant documents and certificates of analysis/conformity (COA/COC). Collected, tested, analyzed and labeled samples for a manufacturing company specializing in metal-based chemicals and chemical catalysts. Displayed acumen in organic and analytical chemistry, lab-testing protocols and experiment design through the setup and execution of numerous laboratory testing and experiments on both current and prototype products. Followed EPA and OSHA mandates to ensure the proper, safe disposal of hazardous samples and waste. Completed five-month internship at JKL Company, a specialty chemical manufacturing and distribution company.